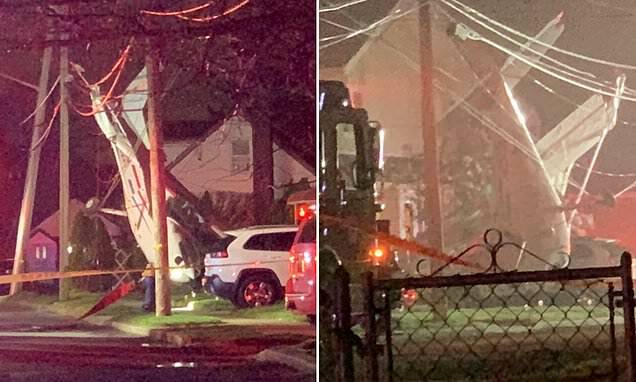 A Cessna 172 aircraft with two passengers and one pilot on board crashed into the front lawn of a home in Long Island on Sunday. One person sprained a finger. The FAA has said it will investigate the crash. Wow. Glad they were okay. Wx looked pretty ugly there last night - viz was pretty low. Existence is pain to a Meeseeks, Jerry. Weather was terrible in JFK all day yesterday. I definitely wouldn’t have been up in a single engine in hard IFR. KIAG-KFRG is about 2.5hours in a 172. A quick glance at the METARS around his (theoretical) time of departure indicates that visibility was really, really low at both FRG and JFK. Looking at the flightaware track, it looks like they did multiple approaches and holds. Definitely not a night I would have been up flying in a Cessna in the Northeast. Did he list Taylor Swift as his next of kin? Not only that but weather was also crappy at most airports within 50 miles so they really had no divert options. There were lucky they survived that crash. Y'know, one of the more humbling/eye-opening moments I had as an IR student was that the available weather envelope really didn't expand as much as I initially thought it would. I've mentioned this before, but my IR instructor was an NTSB guy who did cockpit voice analysis, and in the age of the GoPro he also did analysis on more than a few GA accidents. Rarely did they have this kind of outcome. This ain't about me, though. I'm curious about the pilot's decision loop on this one. I'm sure the NTSB is too. All three passengers survive after small plane crashes in Valley Stream, L.I. We shot a CAT II and landed right in front of him. Heard the whole thing happen. He sounded like a Chinese student of some sort. He burned up all of his gas doing multiple approaches into FRG. Couldn't hold the localizer. His second to last approach was all over the place. He ended up way left of course, turned back to the runway, tried to line up for 31R, which is closed, and then went missed, came back and ran out of gas on his last ILS. I don't think he or the controllers understood the severity of what was going on until it was too late. He didn't declare an emergency, ATC did, and they tried to get him into JFK. Once they realized how grave it was, they did a great job of trying to get him on the ground, but it was a bit windy and 1/8 mi visibility. We heard his last transmission. "Out of gas". We thought he died. It was pretty crazy. Geez.... poor guy. I flew a turn out of jfk yesterday, was about as foggy a day as I can remember. Took off < 800RVR. Life's little ironies... The same lines that carry energy sure are good at dissipating it. That would be a good marketing campaign: "Even when you're out of gas, we've got you. - ConEdison." I see several 709 rides in the future. His US Medical has an expiration of 2011. I guess he must hold a valid foreign medical perhaps ? When I was instructing, a 747 pilot came in to rent a 172. You know...I got this attitude. He went up with another instructor for a check out. Well, he came back humbled. But listening to him, and how he wandered around, it seems he was more focused on weather outside of the plane than flying the instruments. But what nobody has mentioned are the two people with him that I am sure were scared out of there minds feeling totally helpless. I wouldn’t call someone who makes terrible decision after terrible decision after terrible decision a sympathetically “poor guy”. Like wut??? He’s a poor guy like Jerry’s a poor guy when HE finally augers it in.